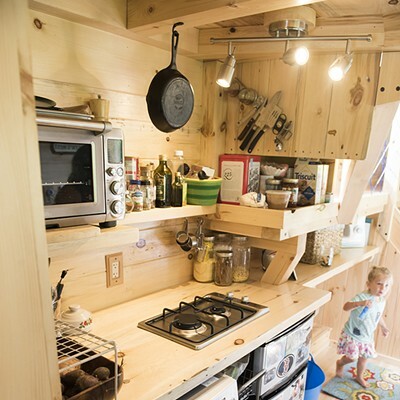 Living Small: A Family of Three Makes a Tiny House Their Home | Features | Kids VT - small people, big ideas! 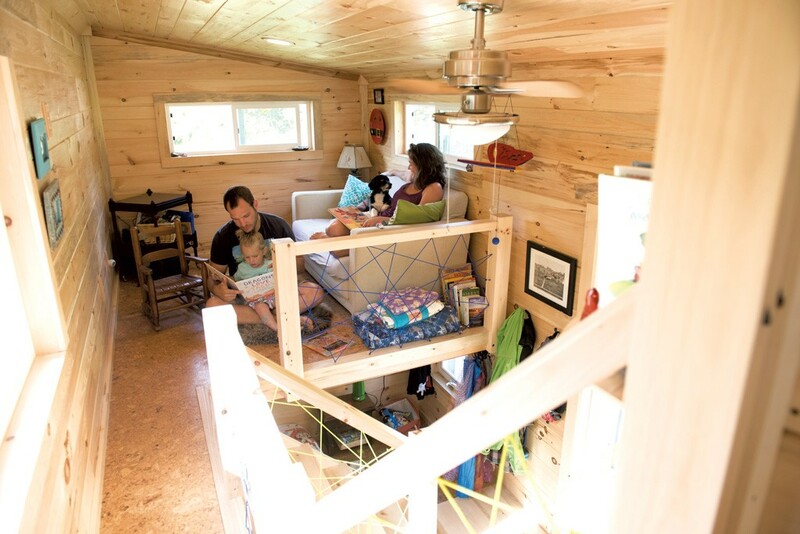 Tiny houses are a big phenomenon. 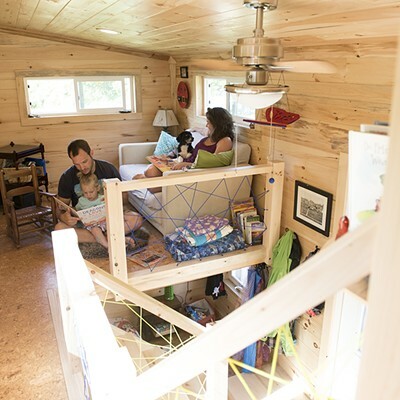 Stories of miniature abodes grace magazines, social media and blogs, and fuel TV shows like "Tiny House Nation," "Tiny House, Big Living" and "Tiny Luxury." Yet as the average U.S. house size creeps upward — from 1,660 square feet in 1973 to 2,679 square feet in 2013, according to the U.S. Census Bureau — a growing number of people are bucking that trend, making do with 400 square feet or less. It's often singles or couples who go small by choice, which makes Erin Morrison and Matt Cutts unusual. In June, they moved into a 200-square-foot home — with their 2-year-old daughter, Robyn, and short-haired Havanese dog, Ziggy. 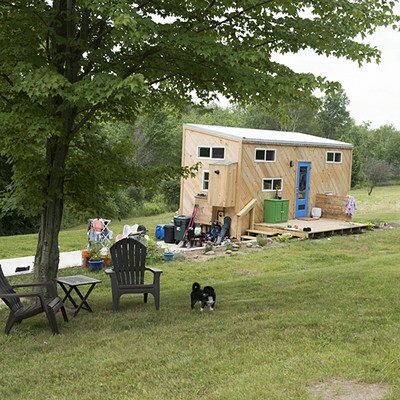 The house sits atop a trailer on a plot of land they bought just south of Middlebury. So far, things are going smoothly. "There hasn't been that moment of 'Oh, this is so tiny,'" says Morrison, "where we're like 'get out of my space.'" Morrison, 28, and Cutts, 34, met and fell in love at grad school in Indiana and later moved to Phoenix. Three years ago, while living in a two-bedroom apartment there, Morrison saw an article about tiny houses. Oh, that's kind of cool, she remembers thinking. Then came a surprise pregnancy. The couple thought they had "missed the boat" on living small, but the pregnancy made Morrison and Cutts reevaluate how they wanted to live their lives. And when they started crunching the numbers — cost of daycare, housing, meals — the idea of building a tiny house seemed to make sense. Then, in 2014, the couple visited Vermont on a beautiful Memorial Day weekend for Cutts' sister's wedding. "I remember joking with Matt's mom, I love it. We're going to move here," says Morrison, who grew up in Alabama and Mississippi. Cutts warned her not to say it unless she meant it. Turned out she really did. The two of them started brainstorming possible layouts on a whiteboard in their Arizona apartment and researched the internet for ideas. Morrison says it was the first "adult decision" that she and Cutts made as a couple, "a step our family was taking together. That part really excited us." Dozens of companies across the county sell finished tiny houses, but Cutts and Morrison wanted to build their own. There were skeptics, like Morrison's old friend in Mississippi who said Why don't you just buy a trailer? Why don't you live in a camper? It gave her pause, but she ultimately realized, "Anyone can do that." But "there's not as much hands-on experience, not as much personal blood, sweat and tears, literally." For them, it was as much about the process as it was about the finished product. That seems to be a common sentiment among many tiny-house trendsetters. The Yestermorrow Design/Build School in Waitsfield has been offering a wildly popular tiny-house course for the past five years. Executive director Mike Crowley says the act of building a house from the ground up "allows people to become empowered around their own living" and "learn what good design really means." Morrison and Cutts' story aligns them with many of their millennial peers, who have expenses such as college debt and are looking for a more "sustainable lifestyle," Crowley says. 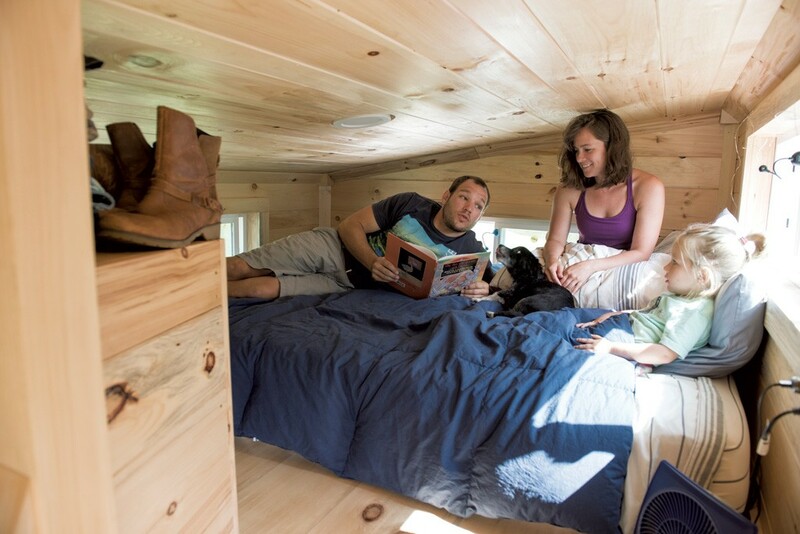 The relatively small financial commitment — compared to having a hefty mortgage payment every month — makes tiny houses appealing. Cutts and Morrison's house and land, for example, cost less than $100,000. 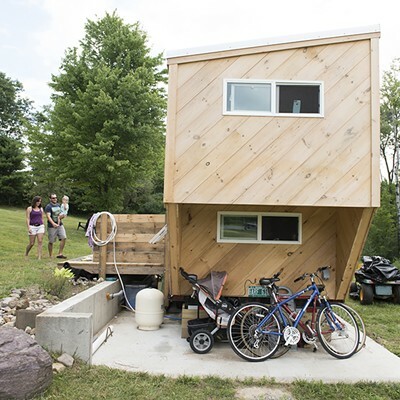 It's impossible to know how many tiny houses there are in Vermont. 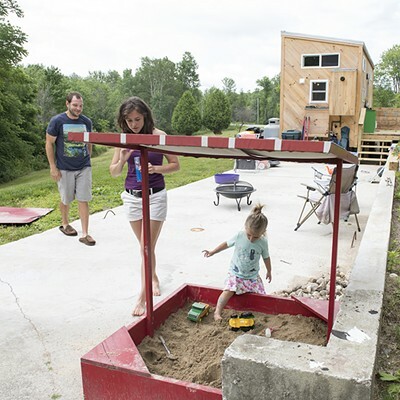 The state doesn't track them, and there's no specific definition of what constitutes a tiny house in state statute, says Shaun Gilpin, housing policy specialist for the Vermont Department of Housing and Community Development. But Chrissy Bellmyer, student services coordinator for Yestermorrow, knows of quite a few. 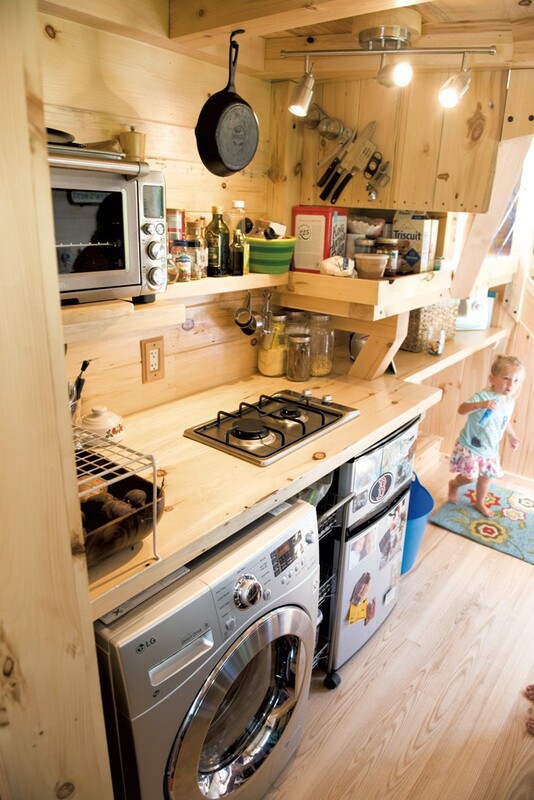 She built a 240-square-foot house herself last summer and has heard about many others through word of mouth. Many tiny-house dwellers go below the radar, she says, since the structures often don't meet local building codes. "Most zoning enforcement is complaint-driven, and Vermont is a rural state," she notes. She characterizes the movement in the state as "pretty strong." In May of 2015, Morrison and Cutts packed up their apartment in Arizona and, along with 1-year-old Robyn and dog Ziggy, drove to Cornish, New Hampshire, across the Connecticut River from Windsor, Vermont, where Cutts grew up. They'd planned to construct their house on property belonging to Cutts' mom and stepdad — an engineer who'd built several houses — while they searched for land. Cutts' stepdad had all the necessary tools, including a 3D-design computer program that allowed them to better refine their plan. They shelled out around $4,500 for an 8-by-20-foot trailer, which serves as the base of their house. Several weeks after arriving in New Hampshire, Cutts was hired as an athletic trainer at Middlebury College. "After we found out he had a job, we were like, Head down, let's go," says Morrison. The couple rented an apartment near Lake Champlain in Addison to be closer to Matt's work. Erin, whose background is in college recreation, soon got a part-time position at the Addison County Athletics Foundation, an organization that works to give kids more access to sports. Every weekend, they drove the two hours to Cornish to work on their house. Cutts' mom entertained Robyn while the couple labored alongside his stepdad and stepsister. 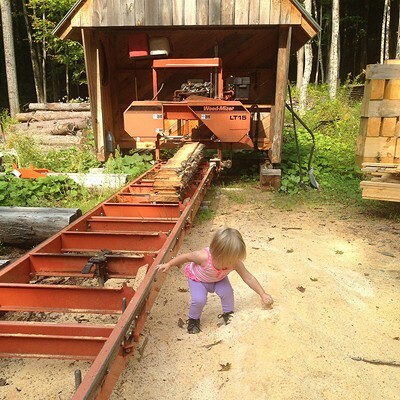 All of the wood came from pine and ash trees on the property, which they milled on-site. Morrison estimates they spent around $20,000 to build and outfit the house, a price tag that includes the trailer, hard materials, appliances, fixtures and furniture. Some things, like their pullout love seat and their coffee maker, they got for free or cheap. Because the wood and tools were already provided and the labor was free, they were able to keep costs down. "There's no way we would have any of this without them," Morrison says of Cutts' family. While Morrison and Cutts were building the tiny house, they were also looking for a spot to park it. The couple contemplated renting land but eventually decided they wanted to buy it as an investment, and so that they could settle more permanently. Initially they had visions of space to roam, with room for farm animals, but they soon realized that their $75,000 budget didn't go far in Addison County. They looked at lots of "primitive" spots, says Morrison, but settled on 3.4 acres south of Middlebury. A mobile home had been set up for several years prior, so there was a septic system, electricity hookup, water well and foundation already in place. Two things it didn't have: internet or cell-phone service. Because housing regulations vary by state, and even by town, Morrison and Cutts did their research. 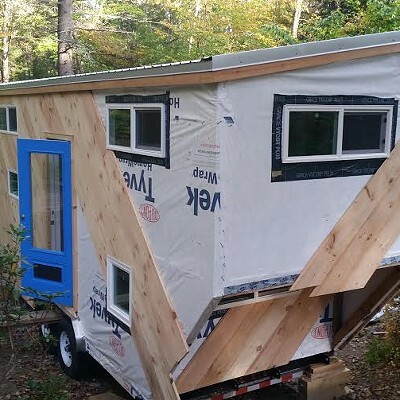 Last summer, they talked with officials from the towns they were considering to see what was required in order to park a tiny house there. "All were pretty welcoming but also not too sure how to answer questions specifically for tiny-house living," Morrison says. In the end, she says the regulations and permits were similar to those required to set up a mobile or modular home on a plot of land. Initially, they were hoping to install a grey-water system to recycle water from their sink, shower and washing machine, but they were told by the Agency of Natural Resources that it wasn't permitted in Vermont. 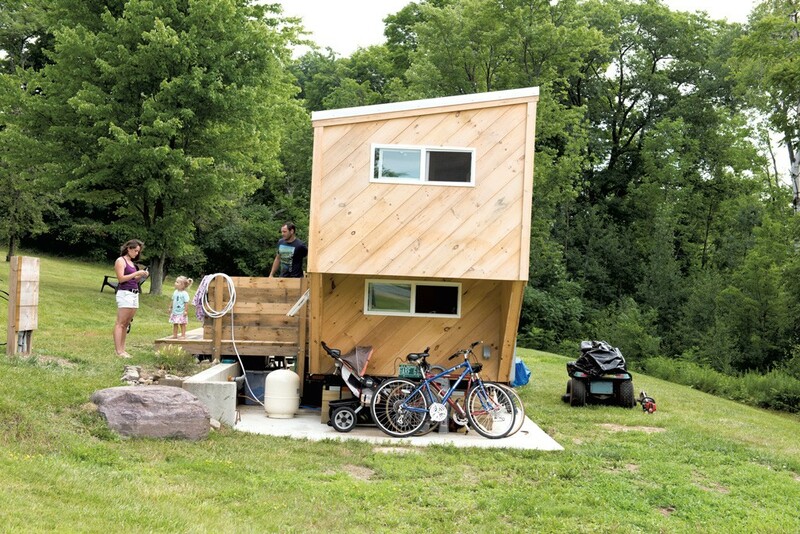 Moving into their tiny house in the beginning of the summer has allowed the family to spend plenty of time outdoors. 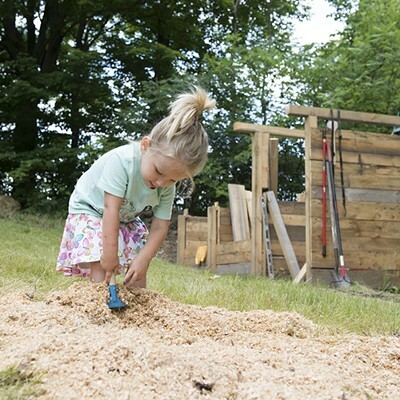 A sandbox and a swing set, donated by Cutts' boss, provide entertainment for Robyn. Since the tiny house only takes up a small section of the preexisting concrete foundation, they use the remaining slab as a patio. Like most homeowners, they still have an ever-evolving list of home-improvement projects. They're thinking of mounting a TV on the living-room loft wall so that Cutts, an avid sports fan, can stay in the loop during football season. For now, a portable DVD player allows them to watch the occasional movie before bed. The couple is also saving up for a heater for winter. They plan to sew curtains to block out the headlights from trucks at night, add an awning and railings to the porch, and build a flip-up table in the kitchen so the family can sit together during dinner. But, for now, Morrison and Cutts are content to rise when the sun does and savor their coffee outside. "I'm surprised at how motivated I am to get up ... how well-rested we feel," marvels Morrison. "We're finally able to enjoy the last year's worth of preparation, planning, hunting and searching," says Cutts. Morrison describes a recent morning scene: She and Cutts were outside, watching Robyn play. "Dude, this feels so good right now," she remembers thinking. "I'm sitting, drinking coffee, looking at our house. It hit us very quickly — this is awesome." Every square foot matters when you're designing a house that's half the size of an average two-car garage. And there are additional concerns when you have an active, risk-taking toddler as a roommate. Here's how Morrison and Cutts made it work. 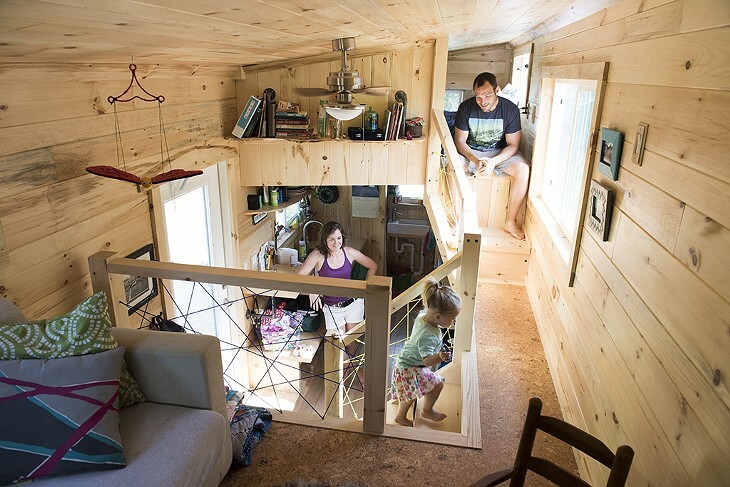 Elevated sleeping lofts are common in tiny houses, but Cutts and Morrison knew that wouldn't be safe for Robyn, who learned how to navigate stairs just a couple of weeks before they moved in. 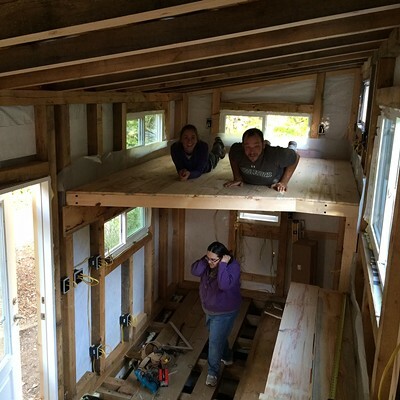 Instead they built their daughter a reverse loft, just one step down from the entryway. Colorful strips of material, left over from making a tutu, hang down from a copper pipe to create a whimsical passageway into the bedroom. There's a twin mattress on the floor with vintage WrestleMania bedding from Cutts' childhood. A built-in toy chest houses her blocks and puzzles; her entire wardrobe fits into a small wicker bin on a shelf by the front door. A short set of stairs, with webbing made from electric blue and neon yellow Paracord to prevent Robyn from falling, leads to Morrison and Cutts' bedroom loft on the left. It's just tall enough for them to sit up in bed. Two long wooden shelves hold their clothes, with the family's winter gear sealed up in big Ziploc bags underneath. On the right side of the stairway is a living-room loft outfitted with a love seat that converts to a bed. The kitchen, to the left of the entryway, is no smaller than many New York City apartment kitchens. 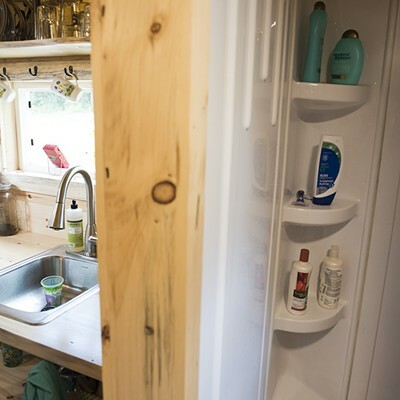 On one side, there's a small stainless steel sink and some wood counter space. On the other side is a mini-fridge, a two-burner range and large toaster oven. The couple cooks dinners much like people in an average-size home, preparing sautéed veggies and meat, pasta dishes, and fruit smoothies with greens from their garden to give Robyn some extra vitamins. When both adults are in the kitchen at the same time, "we bump booties every now and then," Morrison explains. "But that's nothing to complain about." Through the kitchen is the bathroom, which includes a shower fitted with a showerhead rigged to shoot water in, rather than out, and a composting toilet. Morrison and Cuts are growing cherry tomatoes, kale and herbs in containers outside their house. Gardening tools, a hiking backpack, bikes, golf clubs, a kids' stroller and a plastic baby-doll stroller sit near both ends of the house. Clothes and cloth diapers hang off a drying rack. At the far end of their property is a burn pile and a large wooden composting structure they built. They dump grass clippings and the contents of the composting toilet into it and, in a couple of years, hope to have soil they can use. Morrison and Cutts bought the 8x20-foot trailer in July of 2015. 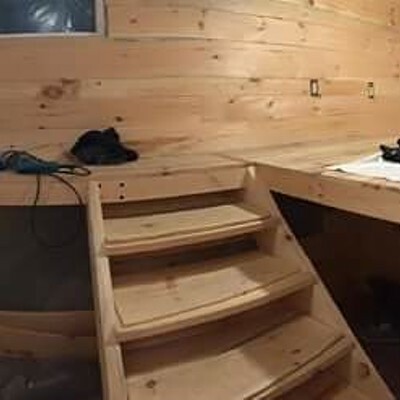 While they waited six weeks for the trailer to arrive, they began finalizing design and milling pine boards for interior and exterior siding and, later on, ash for the floors. All wood came from Cutts’ mom and stepdad’s land. When the trailer arrived, they removed some of its wood base to make it lighter and so they’d have more room to insulate the floor. 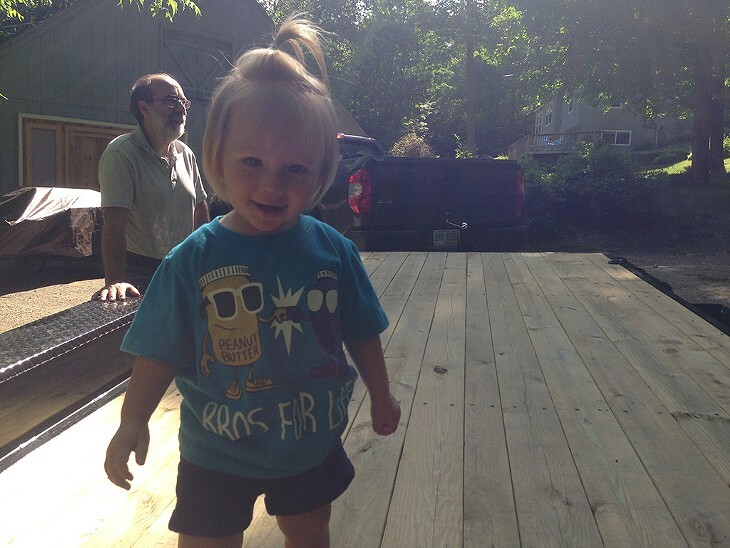 That wood eventually became the tiny house’s front deck. The building process involved putting in floor joints and walls, framing the roof, adding the metal roof and then wrapping the house in a water-proof barrier. They installed the plumbing within the floors and bathroom walls midway through the build. After waterproofing the house, they installed windows and doors and put up pine siding. Shortly after, they began electrical wiring. They used recycled denim to insulate the house after all windows, doors, roof and siding had been installed, and the house was water tight. 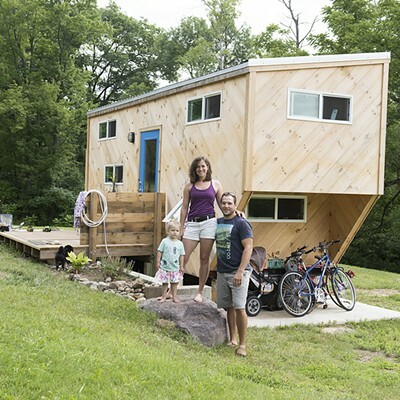 In June of 2016, the family moved their tiny house to land outside of Middlebury. Once there, they added a pressure tank for the existing well to bring water into the house. The electric company connected power from the street to the house. A propane tank was delivered to fuel some of the appliances. 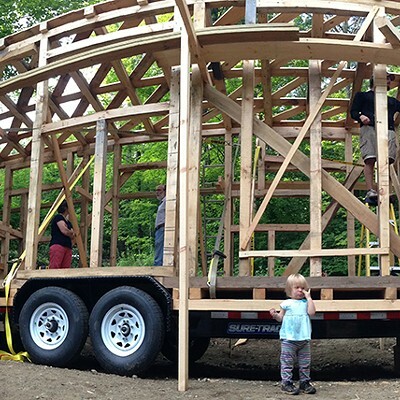 Find out about Yestermorrow Design/Build School's tiny-house building course at yestermorrow.org. We'll be checking in with Morrison and Cutts every few months to see how tiny house living is going.